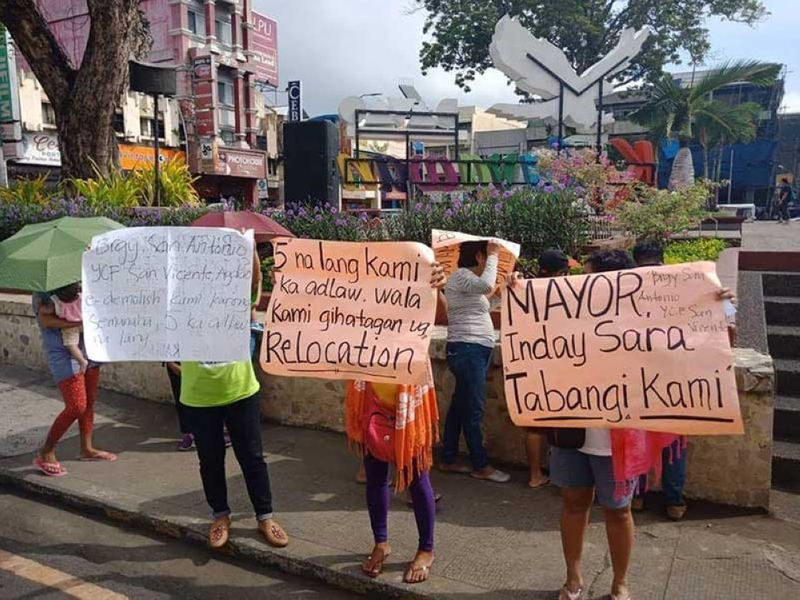 RESIDENTS of San Vicente YCF, Barangay San Antonio, Agdao District staged a rally in front of the Davao City Hall on Monday, September 10, 2018, to ask Davao City Mayor Sara Duterte-Carpio to help them relocate. A notice of demolition was issued by the Municipal Trial Courts in Cities 11 branch 2 last September 7, giving the 13 families only five days to vacate the area that they have occupied since 1986. “Nakuan mi kay lima naman lang kaadlaw ang gihatag sa amoa. Asa diay mi mubalhin? Wala man mi kabalhinan (We were given only five days relocate. Where should we relocate? We do not have a place to go),” said Ofelia Somoza, resident and president of San Vicente Neighborhood Association. “Ang among plano kay manawagan mi kang Inday Sara nga mahatagan mi niya ug pagtagad. Kay ug unsa man gani, mubayad man gyud mi (Our plan was to ask Mayor Inday Sara to listen to our plea. Because in any case, we will pay the monthly obligation),” she added. The residents said that they have been paying their monthly obligation since 1992 to the landowner, Jovencio Tancontian, although the latter sold the property to James T. Hoffer from Malabang, Lanao del Sur in 1981. Hoffer then asked them to pay P10,000 per square meter, which was only P500 per square meter as per agreement in 2004. The residents said it was too much for them, given their economic status. “Di gyud mi kabayad. Pero kung muingon siya na staggered, makabayad mi ana kay tagi-tagi raman. Kintahay bayaran namo for 25 years kay maningkamot man gyud mi ug bayad ana (We cannot really pay it but if he will say staggered payment, we will do our part to really pay it for 25 years for instance),” Somoza said.